After a few days in Hoi An, it was time to move on to Saigon (Ho Chi Minh City). As Hoi An doesn’t have a train station, it meant getting a taxi to Danang and then a train from there. 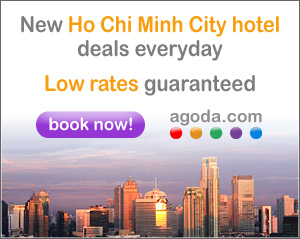 Click here to book a hotel in Saigon. You can get a variety of tickets for this journey, but we chose the soft sleeper. Tickets cost VND 1,149,000 ($55, £35) each. Journey time was around 18 hours, so having a bed was worth paying extra for. The soft sleeper compartments have four beds, so we shared with some Vietnamese people. When we boarded the train there was already a man and his son sleeping in one bed, and another man that also boarded at Danang took the other bed. At the next stop, the man got off and a woman got on. The next stop, the man and his son, and the woman got off, and a husband, wife and baby got on. So we shared our compartment with a few different people, all of whom were very friendly. There is hot and cold water available in each sleeper carriage, so we were able to make tea and coffee. We also brought quite a few snacks with us for the journey. A variety of food is also available on the train. It’s advisable to buy train tickets at least a few days in advance, as many trains get fully booked. We had to put our journey back one day due to our preferred train being fully booked. An interesting aspect of the journey is that Vietnamese songs are played on the train as it arrives at some stations. Here’s what was playing as the train arrived in Ho Chi Minh City. When you get to Saigon you’ll need to take a taxi to your final destination. Even though we both had a big suitcase with us, the taxi officials wanted us to take motorbike taxis and hold onto our large suitcases on the back. We just laughed. As our hotel was only 2-3 km away, many of the taxis didn’t want to take us unless we agreed to a fixed fee instead of using the meter. We declined. So we hung around until the crowds had gone, and then found a taxi driver that agreed to use the meter. The cost to out hotel was VND 40,000. The taxi drivers who wanted a fixed fare asked for VND 100,000, so quite a big difference.